For customized directions, click here. Head North over the Mackinaw Bridge then take exit 344B to merge onto US-2 West toward Manistique / Escanaba. Drive 56 miles then turn right onto H-33 / Manistique Lakes Road. Continue 3 miles and take a left onto Brotherton Road. Pavlica’s SOUTH SHORE Resort will be on your right. Head South on I-75 South then take Exit 386 for M-28 toward Newberry / Munising. Turn right onto M-28 West and continue for 56 miles. Turn left onto M-117 South and continue for 14 miles. Turn right onto US-2 West and continue for 8 miles then turn right onto H-33 / Manistique Lakes Road. Continue 3 miles and take a left onto Brotherton Road. 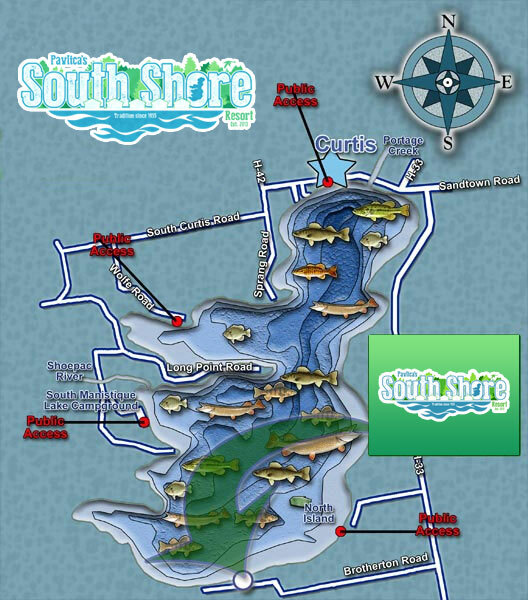 Pavlica’s SOUTH SHORE Resort will be on your right.